A student walked by the new dorms at the University of Massachusetts in Boston on Friday. The freshmen who moved into UMass Boston’s first-ever dormitory on Labor Day made history, helping to turn the campus into something more than a commuter school. But two months into the school year, the dorm — two gleaming structures by the waterfront on Columbia Point, housing 1,077 students — is turning out to be more like the Tower of Tribulations than the Taj Mahal. It’s safe to say there are growing pains at the residence hall. Students love living so close to class, but the dorm living, which costs between $9,000 and $12,000 per year, not including meals, is not as advertised. “They don’t know how to be a dorm yet,” said Dominique Counos, a freshman from Agawam who was in an elevator that dropped. “It was like a deep fall, but we managed to keep standing up,” said her friend Ashley Gospodarczyk, who was also in the elevator when it jerked downward several times from the seventh floor before shooting up to the 12th. While the elevators were being repaired, students had to take the stairs to their rooms. Until recently, residents said their complaints have fallen on deaf ears. This week, however, when the Globe inquired, the university’s interim chancellor pledged to investigate. The new dorm was years in the planning. UMass officials have said allowing students the opportunity to live where they study will improve their academic performance. However, they encountered resistance from neighbors, and from politicians on Beacon Hill, who were lobbied by private schools that feared the competition. Newman said she is developing a plan for improvements and has asked for five specific measures to be taken in light of the complaints. She wants a review of outstanding facility issues by the construction company and building manager and the creation of a hotline for complaints from residents. She says UMass will remind residential assistants and residents to adhere to rules about visitors — there have been complaints about intruders — and will create a committee to oversee food service improvement. And Newman wants to survey students every semester about all aspects of dorm life. She encourages them to share their complaints. There will be a lot to investigate. Complaints range from the ordinary — limited dining hall hours on the weekend — to downright concerning, such as strangers spending the night in the common rooms. Problems that might otherwise be a big deal — construction drilling that begins at 6 a.m. — seem minor compared with other concerns. Perhaps most alarming, students say they feel unsafe because practically anyone can get into the dormitory thanks to lax supervision at security turnstiles. They report unauthorized overnight guests and older students coming in on weekends to sell alcohol to minors. “It feels very unsafe,” said Mikell Mahan, a freshman from Fairfax, Va.
On a recent day, a reporter watched groups of students push through the turnstiles while only one swiped an ID card as required. An alarm sounded, but no one responded. A piece of paper taped to the gate that read “Please do not push through the barriers” was ignored. The bathrooms are another issue. One student said she was asked to stop taking a shower because water leaked onto the floor below. Another said that for two days, water shot out of one toilet when another one was flushed. Not to mention that the bathrooms aren’t well cleaned on the weekends, according to students. “There is always blood, vomit, or pee everywhere,” said Mahan, who lives in the east building. The walls are so thin, students say, that it’s easy to know a little too much about what’s going on in nearby rooms. Also, students were instructed to use sticky strips instead of nails or tacks to hang posters on their walls, but the adhesive quickly rips off paint and drywall. They worry about being fined for damaging their rooms. One said she used white nail polish to cover one up. “I’m worried about all of the costs that are going to come because the walls are literally like cardboard,” Mahan said. The list goes on: Laundry machines are often broken, mail is delivered late, pool cues and TV remotes are missing, and the shuttle to the JFK/UMass MBTA station often skips its stop at the dorm. Students said some classmates have already moved out, opting for the headache of commuting over the indignities of dorm life. Rebecca Engel, a freshman from Auburn, has a particular problem with the dorm water, which she said comes out of the tap white and fizzy. She is pretty sure it killed her goldfish, King Boo. Engel, who has had many pet fish, said King Boo died within days of using dorm water in the bowl, even after she filtered it. The cafeteria is run by Sodexo, an outside contractor that also services the Campus Center. Students said the food started out good but went quickly downhill. They want to eat healthily, but the main offerings are pizza, pasta, and burgers. There aren’t many vegetables besides salad, they say. “They definitely don’t have healthy options,” said Counos, who lives in the east building. The dining hall has been using disposable plates and utensils for days, they said, with no explanation. The soft serve ice cream machine is often broken, they said, but that seems minor compared with undercooked hamburgers and chicken. Meal plans cost $5,390 per year. On a recent visit to the east building, where the ground floor is open to the public, these problems were all too easy to spot. The ceiling just inside the entrance had sprung a long, steady leak (it was not raining), and maintenance men rushed over with a trash can and a ladder to investigate. The dorm was built, and is operated, by a private, for-profit company that leases land from UMass. Students make their housing payments directly to the company, Capstone Development, which will own the building for 40 years. After that, ownership will revert to UMass. Capstone Development spent $119.4 million building the dorm, while UMass Boston contributed $18 million for staff, the dining hall, and other services, according to a university spokesman. “We regret any inconvenience to student residents in addressing these items. We will continue to provide prompt and professional attention to any construction related repairs that are needed,” the Capstone statement said. Building problems, unfortunately, are not new to UMass Boston. The original campus construction in the 1970s was the subject of a corruption scandal that sent two state senators to jail. 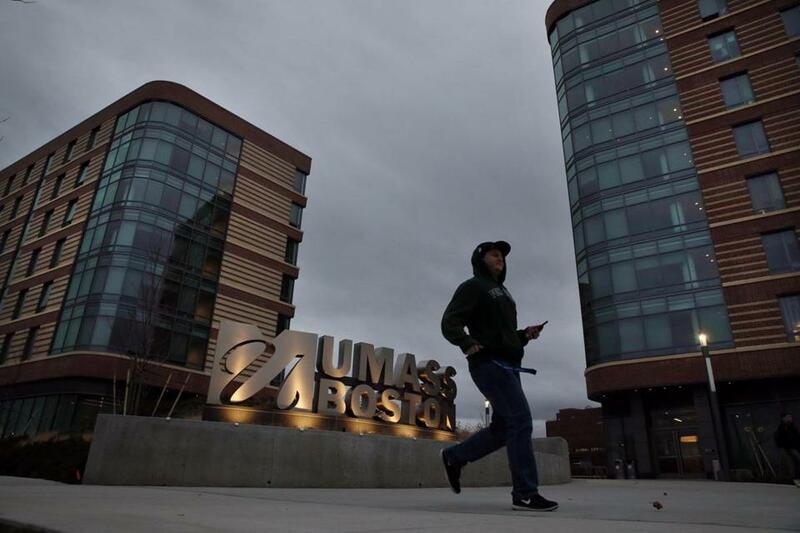 The poor quality of that work almost immediately saddled the campus with millions in needed repairs, and UMass Boston has struggled to address those problems ever since. The biggest challenge is the massive underground parking garage that forms the foundation for many campus buildings. It is in danger of collapse and has still not been made fully secure. UMass Boston has addressed some of its the major construction challenges, but the problems at the dorm could add more. There are no immediate plans for more dorms at UMass Boston, though long-term planning documents show the possibility of a second residence hall across the street. Though students are fed up with the problems, some are sympathetic to the staff who work in the dorm. They acknowledge that it’s a lot of work to open a new dormitory. Evan McGinness, the student whose toilet sprayed water for two days, said most students don’t want to move; they just want the problems repaired. “I hope they are able to fix the problems so that it doesn’t happen again when they build the next dorms,” he said.